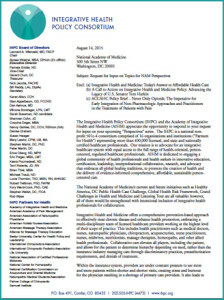 IHPC and AIHM encourage the new National Academy of Medicine to embed integrative practitioners into its important initiatives such as Healthy America, and Grand Challenges in Health and Medicine. The letter was written in response to a request from the new National Academy of Medicine (the former Institute of Medicine) for recommended topics for its series of “Perspectives” that are contributed by outside experts and organizations. You can see the current list of these contributions here.